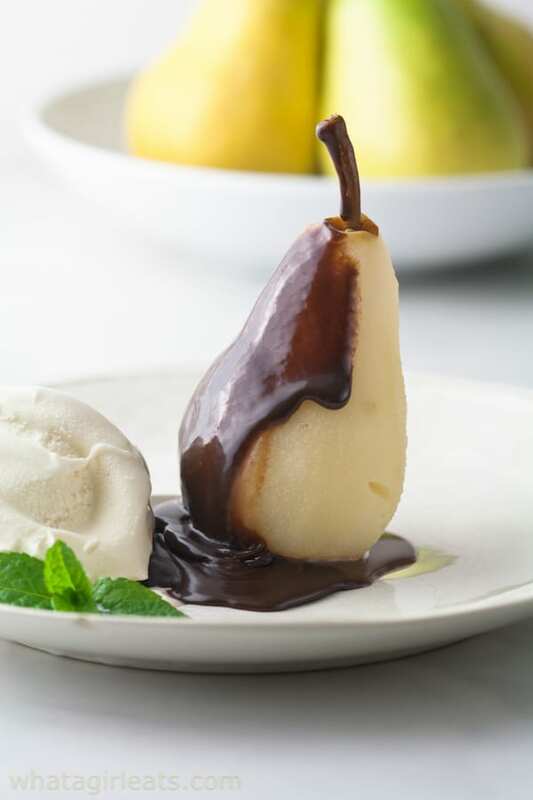 Poire Belle Hélène is an indulgent dessert, made of poached pears with dark chocolate sauce and vanilla ice cream. This post was first published on October 22nd, 2011. I’ve recently updated the photos. This post contains affiliate links. 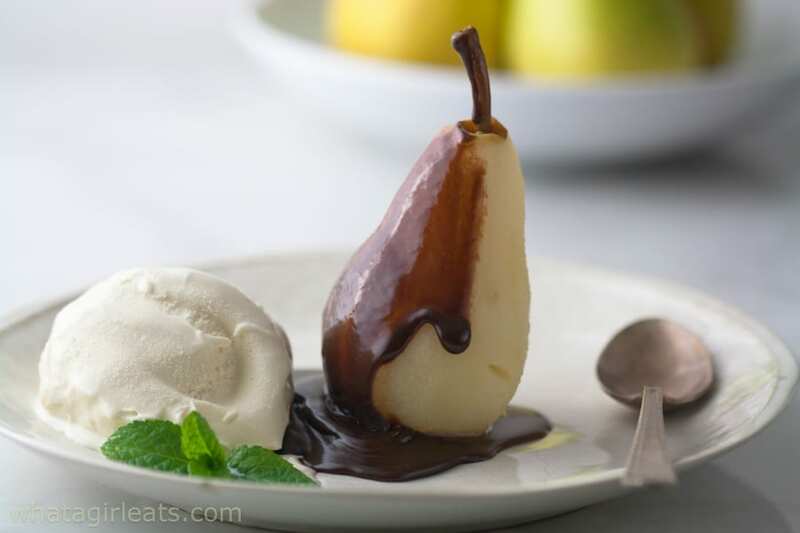 Poire Belle Helene, poached pears with chocolate sauce and vanilla ice cream. The first time I went to Paris, was just after college and I was backpacking through Europe alone. I ended up there sometime in early autumn. One night, I treated myself to dinner at the famous four star restaurant, “La Coupole”, on the Boulevard Montparnasse. The romantic, artsy side of me wanted to sit in the same booths as F. Scott Fitzgerald, Hemingway, Henry Miller and Picasso. I don’t remember what I had for dinner, but for dessert, I had Poire Belle Hélène, a poached pear on top of French vanilla ice cream topped with dark chocolate sauce. Maybe it’s because I was in Paris, the city of romance, that I think Poire Belle Hélène is one of the most romantic desserts. It’s not very complicated, especially if you choose to use pre-made chocolate sauce. Since autumn is pear season, it put me in the mood for this elegant dessert. Sigh! Perhaps the next time I go, I won’t be alone! 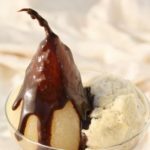 A classi French dessert of poached pears, ice cream and hot fudge. 1 bottle of sweet white wine like a riesling or champagne. I used Prosecco. Bring water, Prosecco, and sugar to a boil in a large dutch oven or sauce pan, add pears and reduce heat to low. Cover and simmer for about 20-25 minutes or until pears are tender, but not too soft. Remove pears and refrigerate until ready to use. Core pears from the bottom, leaving the whole pear intact. 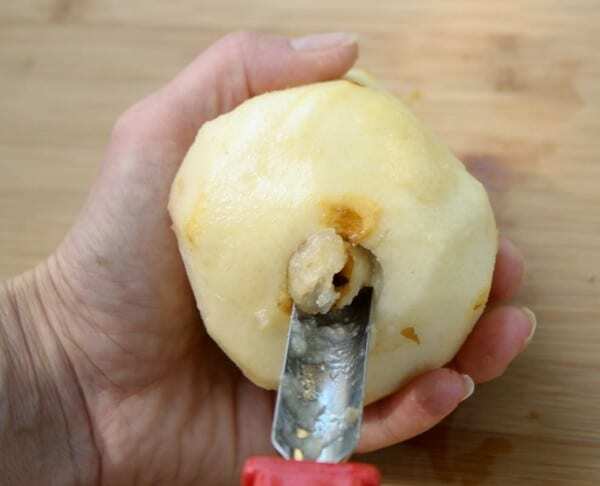 Peel pears up to the stem and core from the bottom. Bring water, Prosecco, and sugar to a boil in a large dutch oven or sauce pan. Then, add pears and reduce heat to low. Cover and simmer for about 30 minutes, or until pears are tender, but not too soft. 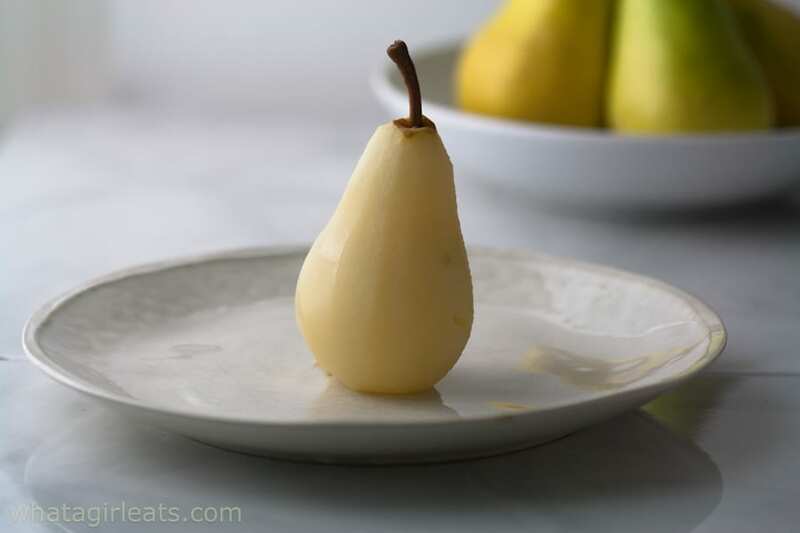 Remove pears and put into a serving dish (see below), then refrigerate until ready to use. 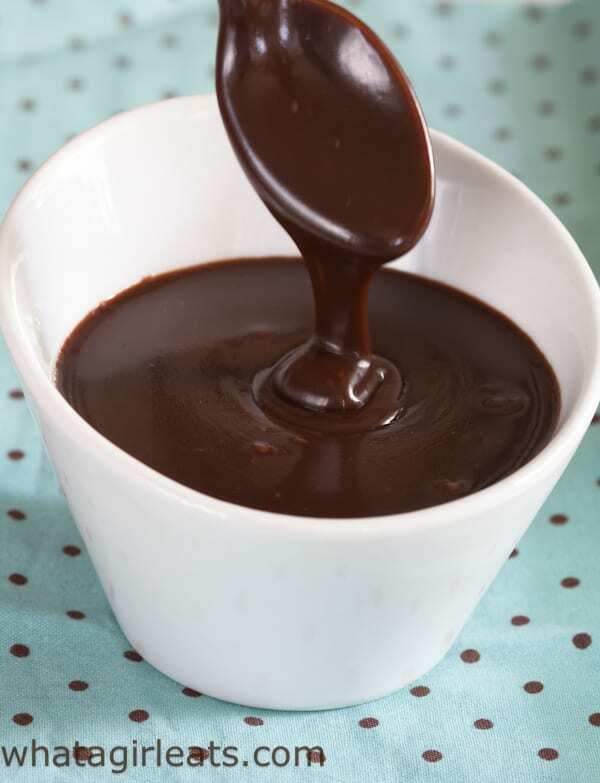 Simmer on a medium low heat and stir until chocolate is smooth, about 5 minutes. Remaining chocolate sauce will keep about a week in a covered container in the fridge. To serve, put a scoop or two of vanilla ice cream and 1 poached pear in a dish. Drizzle with chocolate sauce. Have a great trip Cara! Tres Magnifique! I love the way your mind works!!! You always have the best sweets! What a lovely memory and great choice of dessert! You’ll have to go back and have it one more time, Cynthia. Love that your recipe is so simple. Carole, I think it depends on how ripe your pears are. If they are fairly firm, which I suggest, because a fairly ripe pear would be mushy, they will need a bit more than 15 minutes. Another factor is the amount of water and size of the pot. That’s why I say, “or until tender”. Regarding ads, since my website is free, this is the only way I can recoup some of the costs of maintaining it. Although any time you purchase anything from amazon via my website, I receive a small percentage at no cost to you! 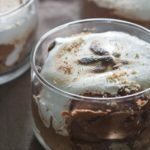 this looks like the perfect Christmas dessert! Simple, yet elegant! Yes, perfect for Christmas! I have few pears sitting in my fridge which I just didn’t want to eat raw. Now I know exactly what I’ll be making using those pears. 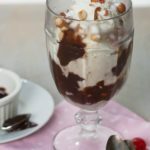 This recipe looks so tasty, and your post is amazing as it allowed me to travel to Paris for a few moments, visit that restaurant and sit next to all those famous people.. oh la la! Can’t wait to have my chocolaty pears..
Haha! Hope you like it! 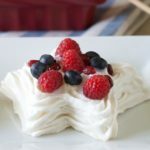 This looks like a great quick Christmas dessert! Definitely! 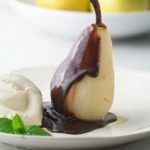 Poach the pears ahead of time and you’ve got a pretty easy dessert! Now that is a beautiful pear! With chocolate! Wow, I’d love this for dessert. This sounds so delicious. I love fruit in dessert dishes. Me too! We can pretend it’s somewhat healthy! 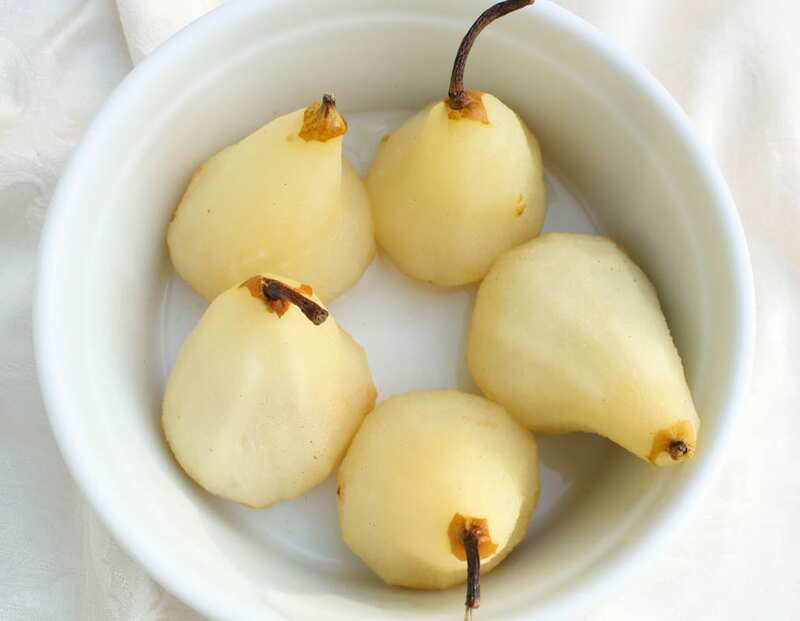 I’ve never had poached pears, but they sound so amazing! I am a pretty big fan of pears, so this is something I may just have to try out. And I love the chocolate!